Tania Larsson starts with the land. 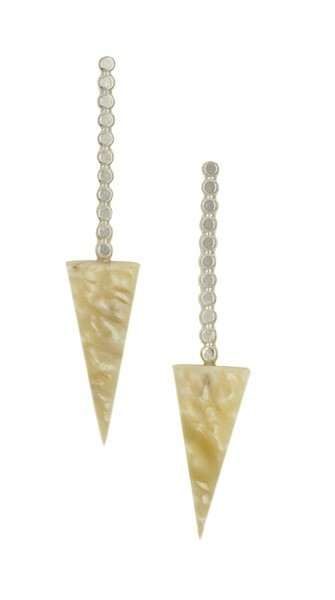 Her materials are harvested from nature, then combined with silver, gold, and precious stones. The combination of traditional craft with a contemporary education results in striking, intricate adornment. Larsson maintains a studio in Yellowknife, but she hand delivers her jewelry works to our gallery shop. View some of our favorites below. When it comes to inspiration, Kat Cole looks to city skylines. Cole studies the constructed environment of her surroundings and replicates the steel structures at an intimate, wearable scale. Her steel and enamel creations are new arrivals to our gallery shop — in dazzling shades of red, yellow, and blue. Design Spotlight: Kat Cole, Robert Ebendorf & more. There’s new work in our gallery shop! You might recognize some familiar faces. Thais Mather recently re-imagined the 200,000 installation from her last solo exhibition with a series of four mask groups in the form & concept Annual Exhibition. Robert Ebendorf replenished his jewelry line with an eclectic collection of brooches, necklaces, and earrings. Snag them before they’re gone! Kat Cole sent us a fiery new necklace—as well as some chunky, industrial rings and brooches. Bunny Tobias is back with more Swarovski crystal and bronze clay creations. Bronze feathers, tourmaline, and undulating patterns are highlighted in this new line. See some of our favorites below, and click the images for more from each artist. “Canyon Road is in flux right now—more than locals might realize,” says Sandy Zane. “It’s on the cusp of a contemporary revolution.” As owner of form & concept and Zane Bennett Contemporary Art, Zane has worked for years to foster a strong contemporary arts scene in the city’s Railyard District. Now she’s opening a dynamic new business on Canyon Road, and is determined to help turn the tide in the notoriously traditional gallery district. Canyon Road Creatives, located at 826 Canyon Road, is a national hub for highly unconventional arts workshops. Zane brings together instructors for the first round of workshops at a free open house event on Saturday, July 21 from noon to 5 pm. Since the soft opening of Canyon Road Creatives in early June, the space has hosted a number of innovative workshops. Renata Gaul and Francesca Rodriguez Sawaya taught weaving and coding in a class presented by the Currents New Media Festival. Solange Roberdeau introduced students to the process of gilding on fabric, paper and wood. Pat Chapman shared her expertise in sculpting with a papier mâché-clay hybrid, and Tobias presided over an epic, multi-round game of exquisite corpse. Canyon Road Creatives is located at 826 Canyon Road, a historic adobe home that’s a few doors up from El Farol Restaurant and across from The Teahouse. Zane owns the building, and previously provided it to Santa Fe Community College’s student-run Red Dot Gallery. When SFCC closed the art space, Zane knew she wanted to keep its educational mission alive in some way. It’s well-suited for workshops, with multiple rooms for classes, a living room with a vast library of art periodicals, and a full kitchen. Zane and Tobias have even bigger plans for the space: they’re working on the plans for an artist residency and exhibition schedule. 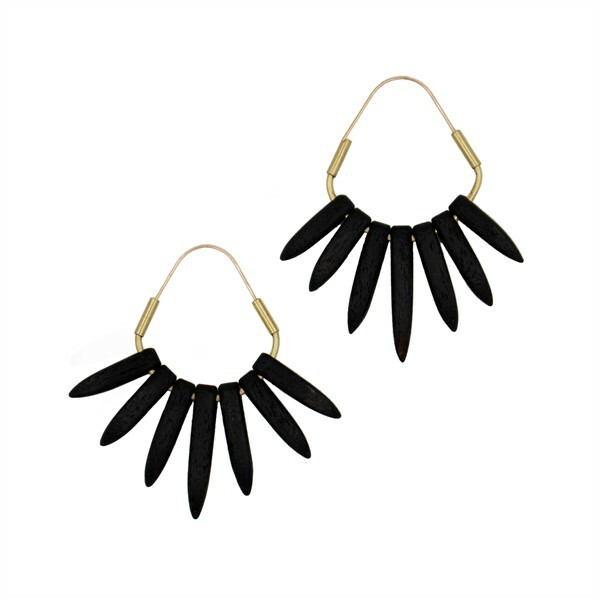 Just in time for Father’s Day, here’s a manly twist on a timeless accessory! Give your dad—or father figure—a bold fashion refresh with the Bro Brooch. This style gadget can be worn in several ways, from the classic above-the-breast-pocket to the faux bowtie. Scroll down for more looks, and browse our complete brooch collection on the form & concept shop website. Jonathan wears Ford / Forlano. Jordan and Jonathan wear Lisa Klakulak. Meet Robin Waynee & Ryan Roberts. We’re honored to announce that internationally renowned jewelry designers Robin Waynee and Ryan Roberts are form & concept’s newest represented artists. The couple has worked side-by-side since 1997, and though they strongly influence each other, they maintain separate practices and bodies of work. They’ll present new designs at the special event Introducing Robin Waynee & Ryan Roberts on Friday, June 29 from 5 to 7 pm. Look below to learn more about Robin and Ryan, and browse their work. Make sure to RSVP on Facebook for further updates on their reception. 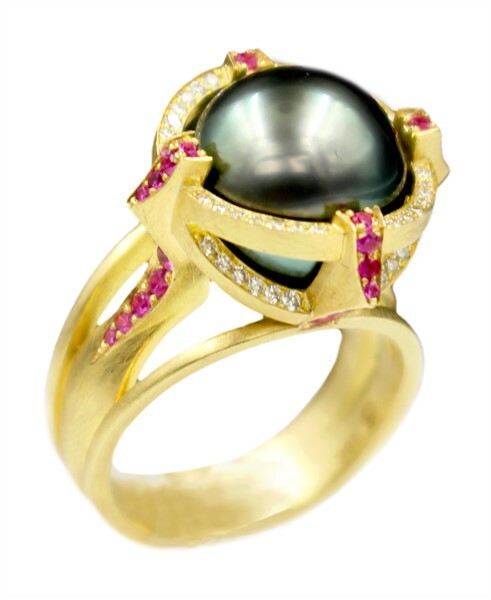 Robin Waynee, Rolling Pearl Ring, 18k gold, pearl, sapphire, diamond. Robin Waynee learned at an early age how creativity and hard work can lead to fulfillment. A member of the Saginaw Chippewa Tribe, Robin was born and raised in Mio, Michigan along with six siblings. Following her family to Santa Fe, New Mexico in 1991, and continuing to work in the family business of custom furniture making, Robin began designing her own pieces and pursued woodworking for several years. 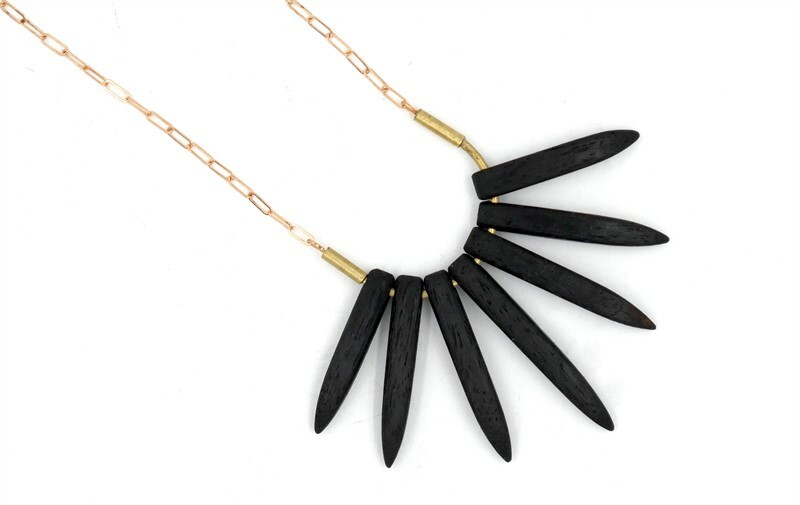 After meeting local jeweler Ryan Roberts in 1997, Robin became inspired by his work and discovered a burning desire to create jewelry. Her wide range of jewelry styles, creative choices of precious stone and metal combinations and anodizing schemes, along with her careful selection of quality materials and attention to detail make Robin’s jewelry highly sought after by the discriminating collector and devotee of exclusive fine jewelry. Browse all of Robin’s work. 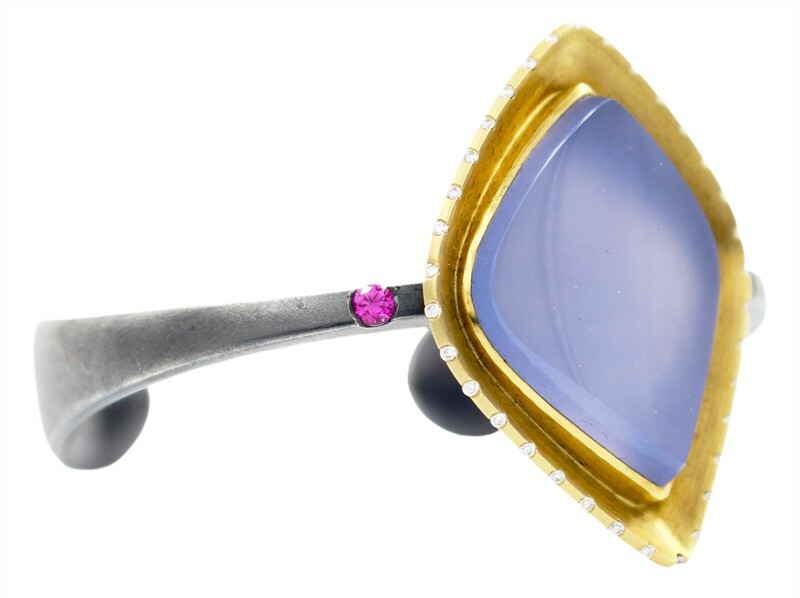 Robin Waynee, Blue Chalcedony Cuff Bracelet, sterling silver, 18k gold, blue chalcedony, pink sapphire, diamond. 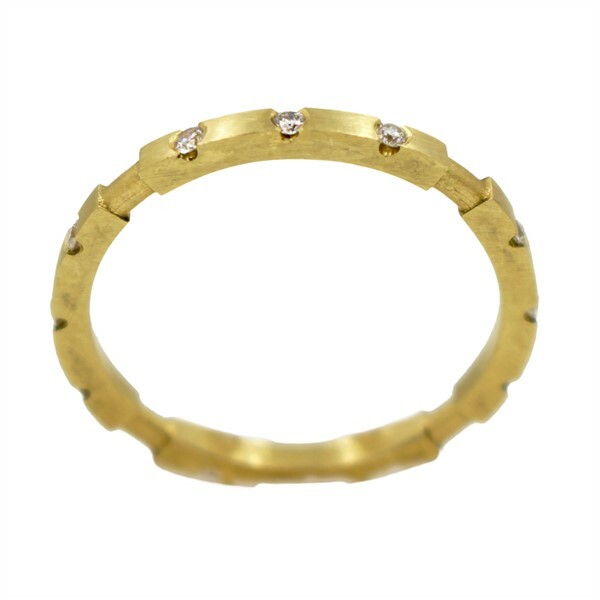 Robin Waynee, Gold & Diamond Stackable Ring, 18k gold, diamond. 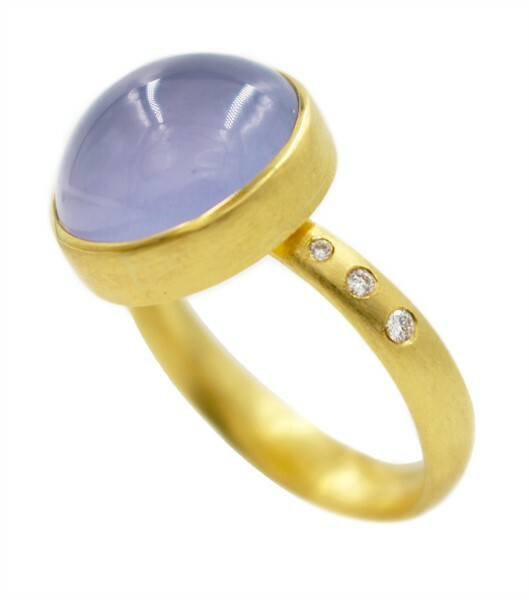 Robin Waynee, Blue Chalcedony Ring, 18k gold, blue chalcedony, diamond. 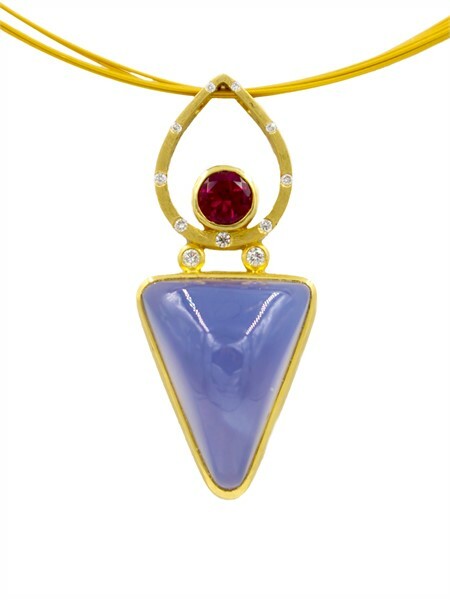 Robin Waynee, Chalcedony & Rhodolite Pendant, 18k gold, blue chalcedony, rhodolite garnet, diamond. 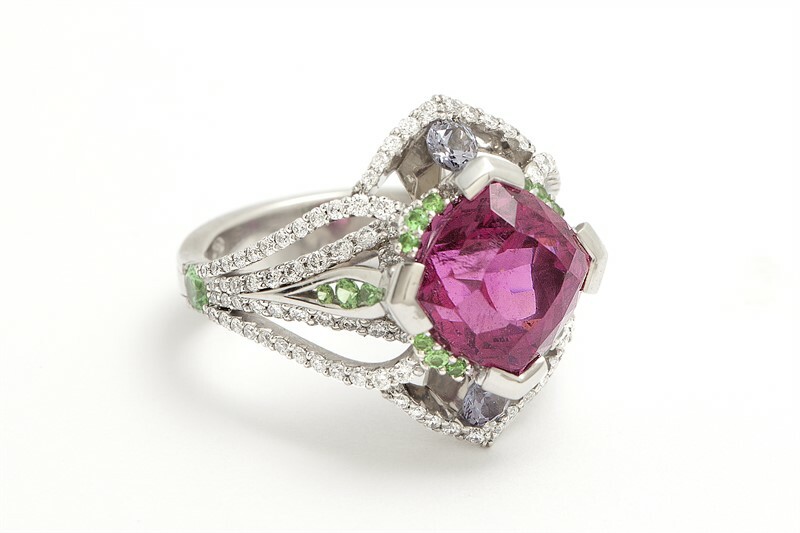 Ryan Roberts, Platinum & Rubellite Tourmaline Ring, platinum, rubellite tourmaline, tsavorite, diamond. Born in the small village of Chimayo in Northern New Mexico, Ryan Roberts was raised in a family in which almost everyone is an artist. When he was a young teen, Ryan lived in Hawaii for a year, where he spent time with his aunt Gayle Bright, a talented sculptor and jewelry designer. Seeing the skill and care with which she made her art inspired him, and he began to cultivate a love and appreciation of jewelry making which would lead him to his life work. Upon returning home to New Mexico, just after his 16th birthday, Ryan secured an apprenticeship at a local jeweler’s studio. By the age of 19, Ryan was hired by one of Santa Fe’s most talented local jewelers, Mario Chavez. In this environment, the young artist was exposed to an expanded array of complex tools and techniques. Ryan’s reputation grew as one of the finest jewelers in Santa Fe. Later, Ryan met the only person he had ever taken as an apprentice: his future wife, Robin Waynee. The two would both go on to become internationally celebrated jewelers. Browse all of Ryan’s work. 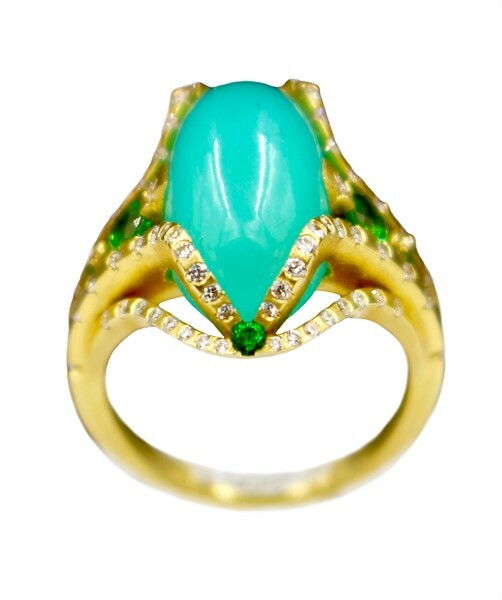 Ryan Roberts, Chrysocolla Gem Silica Ring, 18k gold, gem silica, tsavorite, diamond. 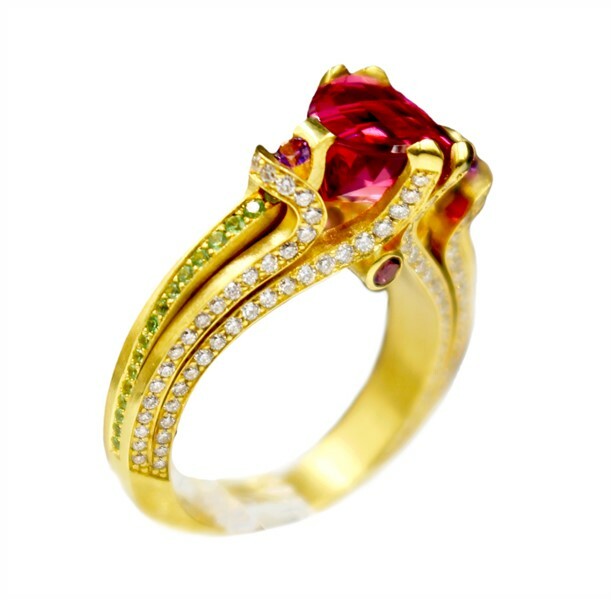 Ryan Roberts, Rubellite Tourmaline Ring, 18k gold, rubellite tourmaline, diamond, tsavorite, amethyst. form & concept @ ABQ Museum. Albuquerque Museum’s new exhibition American Jewelry from New Mexico, opening June 2, features over 300 spectacular objects that span prehistory to the present. We’re pleased to announce that six of our represented jewelers appear in this immense show: Robert Ebendorf, Debra Baxter, Robin Waynee, Ryan Roberts, and Steven Ford & David Forlano of Ford / Forlano. “The 2,000-year history of jewelry in New Mexico incorporates everything from bottle caps to diamonds,” wrote Albuquerque Journal of the exhibition. “Some of the most important American designers and makers of contemporary jewelry live and work here.” Look below to see the works by form & concept artists that appear in the show, with links to their work in the form & concept collection. Danny Hart, Necklace, brass, bronze. Danny Hart‘s latest series of wearable artworks is spectacularly varied in material and technique. To create the new line, he carved walnut, olive, coolibah and tiger woods, and shaped brass and bronze. The result is an elegant collection that’s as versatile as it is visually unified. Look below for some of our favorite new works by the New Mexico-based artist. Danny Hart, Necklace, bronze, walnut. Danny Hart, Earrings, walnut, brass. 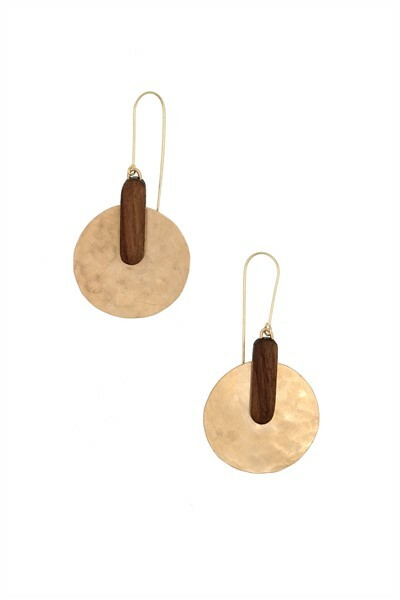 Danny Hart, Earrings, walnut, bronze. 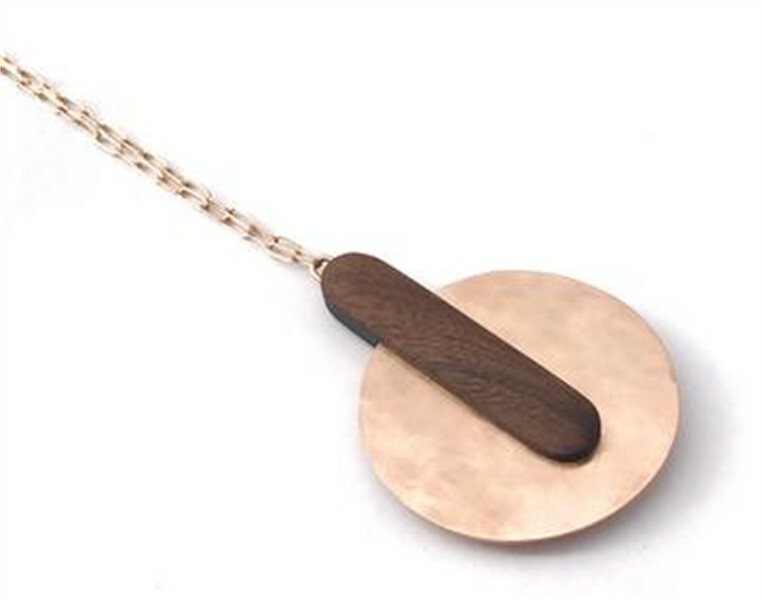 Danny Hart, Necklace, brass, bronze, walnut. Click here to view more wearable artwork by Danny Hart.